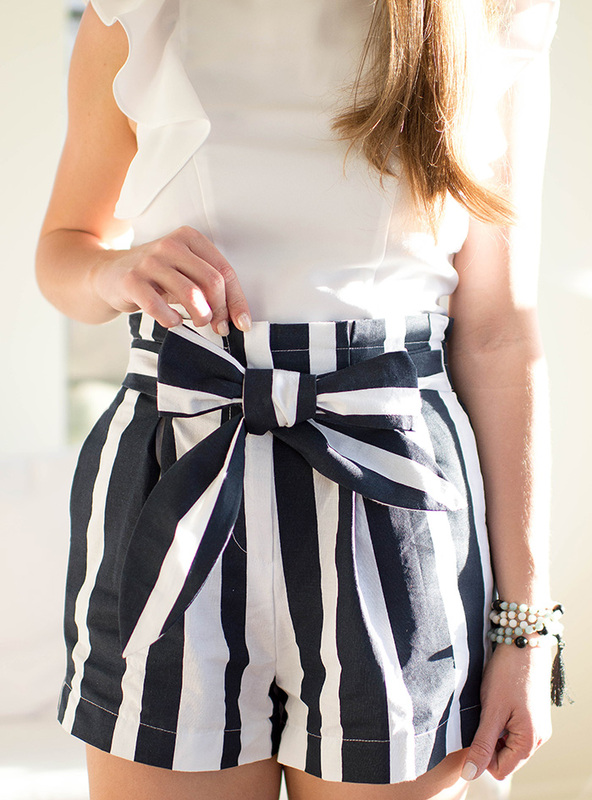 Things I love: bows, stripes, navy blue. Luckily for me, the three seem to be everywhere this season! From bow bikini tops to striped tees to timeless, navy shift dresses, it’s clear I’m not the only one who can’t get enough of them. But y’all… never have I ever come across a more perfect combination of the three than in these darling shorts. I don’t think I could dream up a more perfectly nautical piece if I tried! The high waisted silhouette gives this pair the cutest retro look, making them a must-have for many a seaside vacation ahead. They have me giddy for summer already. I was so excited to find that they went perfectly with my navy bow wedges… a pair I had picked up in January for fear of them selling out before spring! I can already tell you they are going to be on serious repeat within the coming months. Navy is such a beautiful neutral, that pairs with darker and lighter shades alike and it’s safe to say I’m smitten. P.S. Y’all, Tory Burch is having an AMAZING private sale! The items included are up to 70%, plus there’s free shipping. My favorite pair of Derby riding boots from this fall are included, along with this blush bag I’m dying to get my hands on! It ends soon and is sooo good so giddy-up and get with it! NEED those shoes! They’re perfect! 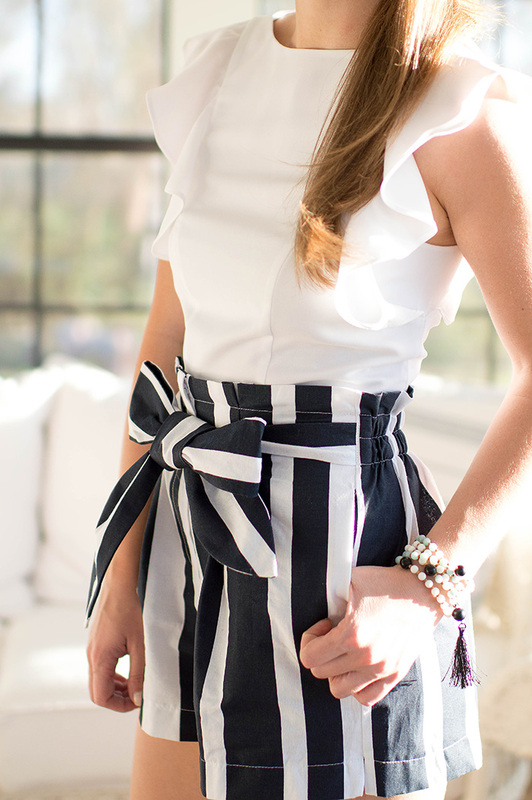 What an adorable nautical look! Your top is fabulous. Black and white stripes are so timeless! You look adorable. This is way too cute! I have been loving all of your outfits lately! Super cute outfit, your shoes and shorts are absolutely adorable! I LOVE Kate Spade’s wedges for this season. Adorable! This outfit is seriously so adorable! I love it! This outfit is GORGEOUS! Love it for the spring/summer So much! These striped shorts are a must have for my spring wardrobe. Im obsessed! !